A slim, energy efficient, rechargable, folding LED lamp for workshop, office, home or caravan. Energy efficient - low heat emission. Hanging slot for wall mounting. 1x 2m USB cable for connection to laptop of PC. 1x Mains adaptor with USB socket. Be honest, how many times have you fumbled around in the dark looking for a way to throw some light on a buried screw head, a tiny bearing, a circlip, or even a delicate soldering job? 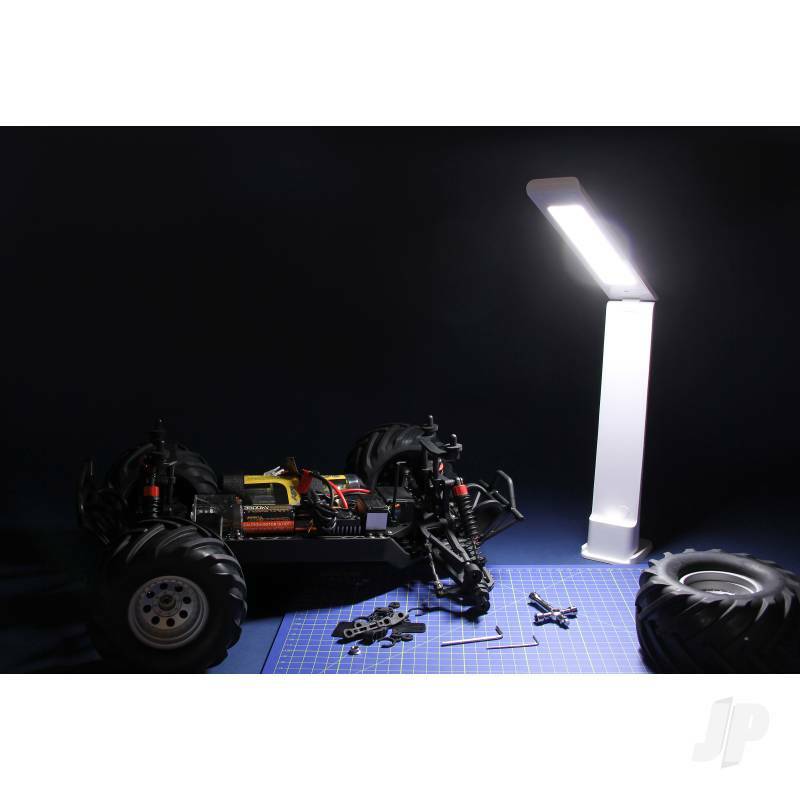 When you start to think about it the range of uses for ModelCrafts slim, rechargable, folding, LED task lamp are many and varied. Add the convenience of its anglepoise head, cordless flexibility and battery saving dimmer function and this invaluable tool will quickly become a treasured fixture. Charged in traditional fashion using the supplied mains adaptor, or via the USB lead direct to your PC or laptop, one three hour charge will provide 1.5 hours of light at 100% luminance, 3 hours at 50% and an impressive 8 hours at 10%. Thats a genuinely useful amount of light, indeed given its compact design youll doubtless find uses for your task lamp at home, in the caravan and, of course, in the workshop where you first envisaged. Of course, we haven't even begun to explore the benefits during a power cut!